Indian tents are comfortable and are available in classic colour. These tent has a sturdy construct and are water proof. Equipped with all necessary facilities, Indian tents are convenient in assembling and disassembling. These tents provide sufficient space under its roof and is very durable. Indian tents are impressive and aesthetically fabricated. Luxury Indian Tent is impeccably designed and provides a sense of innovative and contemporary creativity. 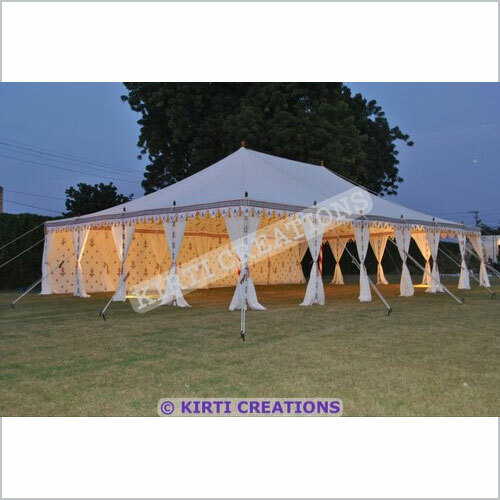 The off white color along with cut work and borders of multi color gives it an elegant look and makes Luxury Indian Tent perfect for an evening tea or any event.